Oil closed above $104 US Friday, its highest level since September 2008, and other commodities also headed higher. April oil in New York rose on fears that unrest in the Middle East and North Africa will disrupt supplies, gaining $2.51 to close at $104.42 a barrel US. In London, Brent crude — the European and Asian benchmark — added 1.2 per cent to $116.15 per barrel on the ICE Futures Exchange. In Libya, tensions escalated further on Friday as forces loyal to Moammar Gadhafi used tear gas to repel protesters marching on Tripoli. Most of Libya's oil production has been shut down because of the crisis. Gold for April delivery climbed $12.20 to $1,428.20 US an ounce. May cocoa traded at 32-year highs, reaching $3,807 a tonne, up $33, or 0.87 per cent, amid unrest in Ivory Coast, the world's largest producer. May cotton rose by seven cents, the maximum allowed in one session, or 3.4 per cent, to a record high of $2.127 a pound in New York. The Canadian dollar hovered around $1.03 US, closing at 102.91 cents US, up .05 of a cent. The rise in commodities helped the Toronto Stock Exchange head higher even while U.S. markets softened, on worries higher energy costs will threaten the economic recovery and despite a strong American jobs report. The U.S. The Bureau of Labour Statistics reported that the American economy created 192,000 jobs in February, the best showing in almost a year. The S&P/TSX composite index closed up 38.05 points to 14,252.77. "Oil is high enough that it has to be a concern," said Jack Ablin, chief investment officer of Harris Private Bank. "The longer it remains at this level the greater the chance that it upends our recovery." Canadian gasoline prices averaged 120.856 cents per litre Friday, according to price tracking website gasbuddy.com, up seven per cent since an uprising in Libya began in mid-February. 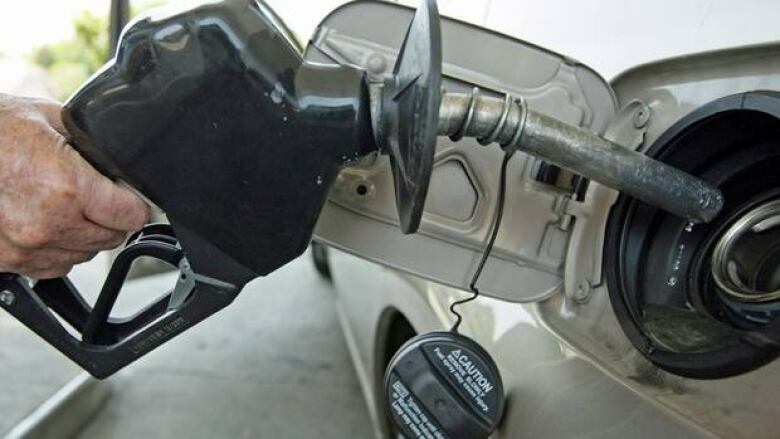 U.S. gasoline prices have shot up by an average of 35 cents per gallon since then, with a gallon of regular unleaded gaining another 4.4 cents overnight to a new national average of $3.471 per gallon, according to auto club AAA, Wright Express and the Oil Price Information Service. RBC Capital Markets released an analysis suggesting one-in-three U.S. consumers are already cutting back on their spending because of higher gasoline prices. Eighteen per cent said they would reduce spending if gas prices climb to $3.75 per gallon. Four-in-10 placed their pain threshold at $4.00 per gallon or more. "What really stands out to us is worry about the future," said RBC Capital Markets chief U.S. economist Tom Porcelli. "The geopolitical issues of recent weeks are seeping into expectations about markets and respondents' financial position. The number of people who expect the value of their investments to 'get worse' rose to the highest level in four months, " he said. "The erosion in personal finances has translated into people thinking they will have less to spend on discretionary items, and that number rose to the highest level in at least a year." The index is based on a poll of 1,004 U.S. adults conducted by Ipsos from February 25 — 28. The poll's margin of error is 3.4 per cent.